After a fire on board the Platinum fishing trawler, METS was asked to travel to Walvis Bay to assess the damage. We successfully performed the repairs in Cape Town, whilst repairs on the fish factory control room were performed on a 24/7 basis, and completed in 2 weeks. 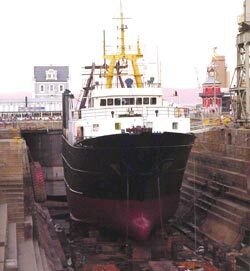 Fire had caused major damage on various sections of the mess room, accommodation, bridge and engine room of this long line-fishing trawler. METS was asked to assess and repair the damage. Work was performed on a 24/7 basis and completed in 10 days. We travelled by launch to the vessel and inspected the fault on the main alternator (680kW). We found that the main stator windings had burnt out. Once the vessel had berthed in Cape Town the unit was rigged out of position and ashore, thereafter transported to factory premises in order to be rewound. The complete unit was ultimately crated and flown to Singapore. METS initiated a complete electrical installation of a new build, in accordance with the "flameproof zone regulations". Work was carried out over period of five months and full commissioning took place in Durban and Richards Bay. We rewound and overhauled three main alternators (250kVA). The units were then transported from Mossel Bay to Cape Town for the completion of the work. On completion, the units were transported back to Mossel Bay, rigged in position and commissioned. We perform regular electrical maintenance, repairs, installations and motor rewinding for most of the Japanese fishing vessels entering the port of Cape Town. We have also designed and built control panels and synchronizing panels for two portable gensets for use in a marine environment.